These types of skin infections are caused by a fungus and are most likely to develop in damp areas of the body, such as the feet or armpit. Some fungal infections aren’t contagious, and these infections are typically non-life-threatening. These types of skin infections are caused by a parasite. These infections can spread beyond the skin to the bloodstream and organs. A parasitic infection isn’t life-threatening but can be uncomfortable. The symptoms of a skin infection also vary depending on the type. Common symptoms include redness of the skin and a rash. You may also experience other symptoms, such as itching, pain, and tenderness. See a doctor if you have pus-filled blisters or a skin infection that doesn’t improve or gets progressively worse. 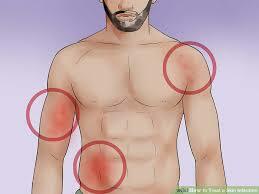 Skin infections can spread beyond the skin and into the bloodstream. When this happens it can become life-threatening. Treatment depends on the cause of the infection and the severity. Some types of viral skin infections may improve on their own within days or weeks. Bacterial infections are often treated with topical antibiotics applied directly to the skin or with oral antibiotics. If the strain of bacteria is resistant to treatment, treating the infection may require intravenous antibiotics administered in the hospital. You can use over-the-counter antifungal sprays and creams to treat a fungal skin infection. If your condition doesn’t improve, ask your doctor about prescription oral or topical creams. In addition, you can apply medicated creams to your skin to treat parasitic skin infections. Your doctor may also recommend medications to reduce discomfort like anti-inflammatory drugs.